Collingwood livewire Alex Fasolo will be forced to wait at least six weeks until rebooting his season. Alex Fasolo's return to senior football ended early, with the Collingwood forward injuring his right ankle during the second quarter against St Kilda on Saturday night. Collingwood hopes returning forward Alex Fasolo can bolster its scoring power in his first game of the season after the Magpies managed just five goals last week. Made a huge impression in his first few seasons on the list, breaking into a ladder-leading outfit in the forward pocket. Shows genuine goal sense and has the confidence to back himself when in possession. His accurate disposal and his long kicking has become a feature of his game, and served him well when he was moved to half back during season 2014. But in 2015, his uncanny goal sense led to the majority of his success. This was furthered in 2016, when Fasolo needed just 12 games to win the Gordon Coventry Award as Collingwood's leading goalkicker. While a move to the midfield and a role at half back remain a viable options if necessary, Fasolo’s ability to hit the scoreboard will no doubt be greatly relied on in 2018 and beyond. A year that wasn’t without its hardships that still produced career-high numbers. Fasolo played 19 games, his most in a season since 2012, and kicked 29 goals from 58 scoring shots. He was at his most damaging early in the season when he began the season with three goals against the Western Bulldogs and four in the thrilling one-point win over Sydney a fortnight later. Bravely, Fasolo addressed the football world about his battle with depression, and sat out the club’s trip west to take on Fremantle. He returned against Melbourne the following week, kicking multiple goals in each of his next five games. Injuries struck late in the piece, keeping him sidelined for the final fortnight, but the 25-year-old, who has now clocked 100 senior games, remains a key player in Nathan Buckley’s outfit. 2016 had the potential to be the breakout season Alex Fasolo has been waiting for. At 23 years old, he entered the campaign with 69 games under his belt and an elevated element of responsibility in the forward line. It took until just round two for the West Australian to show off his new level of maturity. Fasolo was everywhere as the Magpies and Tigers engaged in a back-and-forth Friday night clash at the MCG. Five of his six goals came in the second half as the lead changed eight times and Collingwood snuck home for a famous one-point victory. 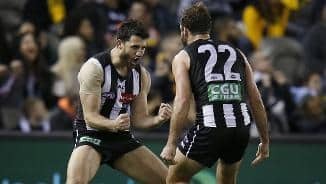 The goals kept coming as Fasolo kicked bags of four against Essendon on ANZAC Day, and again two weeks later against Carlton. He had 22 goals to his name before the bye, just five short of his season total of 25 in 2015. However just as momentum continued to roll, injury struck. The exciting forward was one of four players sidelined in Collingwood’s round 10 loss to the Western Bulldogs. 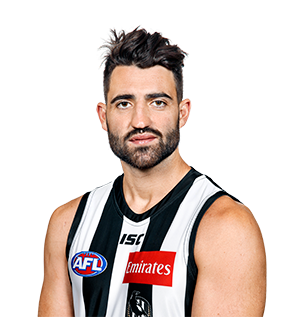 A shoulder complaint would keep Fasolo out for five weeks, and limit him to just two more games before the season was out. While frustrating, the glimpses shown by Fasolo in 2016 lead to promise in the future. He stood upon the Crown Palladium stage at the Copeland Trophy not only to accept the Gordon Coventry Award for the Magpies leading goalkicker, but also to promise more of the same in 2017. Consistency was the focus for Fasolo as he entered the fifth season of his career at Collingwood. After playing the final five games in 2014, a regular place in the starting 22 beckoned, and Fasolo assumed this role from the outset. Despite hitting the scoreboard in both rounds one and two, Fasolo was dropped from the AFL side and remained in the VFL for five weeks where he played as a forward and in the midfield before an eventual recall in round eight. Clearly enthused by a return to the big league, the 23-year-old kicked three goals from 13 possessions in Collingwood’s comprehensive 69-point victory over the Gold Coast. The effort continued a streak which would eventually extend to seven consecutive games in which Fasolo hit the scoreboard. The livewire clearly favoured the MCG as his preferred hunting ground, with 17 of his 27 goals in 2015 kicked on Collingwood’s home turf. The absence of Travis Cloke due to injury left a hole in the Collingwood forward line during the back end of the season, with a number players expected to fill his void in front of goal. Fasolo stepped forward as the main candidate in round 18, kicking three of the Magpies seven goals in a disappointing 37-point loss to Melbourne. He once again stood at the top of the goal kicking list the following week, with four goals as Collingwood reversed their fortunes with a win over the hapless Carlton. It was perhaps the best performance of a season which included 17 appearances, Fasolo’s highest tally since playing 24 games in his second year at the club in 2012. Goalkicking has always been a feature and Fasolo ticked this box in 2015 as he ranked third on the club’s official tally behind Jamie Elliott and Travis Cloke. However it was the arguably defensive side of Fasolo’s game that held his position in the highly-competitive Collingwood forward line. The charismatic Magpie finished 2015 with a tackle average of 2.9 per game, the highest total in his 69-game career. A new role and the overcoming of a series of nagging foot injuries will leave Fasolo feeling confident as he enters his fifth season at the Westpac Centre. 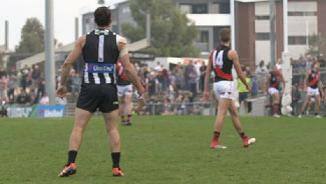 His 2014 campaign began in the VFL as he worked steadily to rehabilitate the foot injury that ruined his 2013 season. He won 15 disposals in the VFL's season opener against North Ballarat and helped turn the game when swung into attack. The 22-year-old broke back into the senior side the following week for his first match since the previous May and quickly hit his straps, breaking the 30-disposal barrier for the first time in his career against North Melbourne in round five. Importantly, 26 of those disposals were won in the defensive half of the ground, marking his shift into the backline. Unfortunately his progress was short-lived, for he was substituted out of the ANZAC Day win with a sore toe less than a week later. Foot niggles restricted him to just one VFL appearance in the three weeks that followed, but he bounced back into the senior team and back into the forward fifty soon after. Fasolo kicked a crucial final quarter goal to help sink West Coast in round 10 and backed it up with four majors in an 86-point win over St Kilda. But even then, it still wasn’t plain sailing. More foot surgery was required, removing a screw that had been troubling him since his navicular operation the previous year. Fasolo returned in the VFL on 12 July, playing two games in the state league, highlighted by a 24-disposal performance against Frankston, before returning to the senior side as the run home began. He remained a consistent contributor during the final five games of the home and away season, playing mostly as a defender with occasional stints in attack. Unfortunately for both Collingwood and Fasolo, the talented goal sneak barely got out of the starting blocks. He had to make do with a limited preparation during the pre-season and began his season in the opening round of the VFL against North Ballarat. He found himself in the substitute’s vest in the seniors against Hawthorn the following week and made an immediate impact, snapping an important goal only moments after being released onto the ground. But that was as good as it got for the 21-year-old who returned to the VFL three weeks later and was rubbed out for rough conduct against Williamstown. If that wasn’t bad enough, Fasolo injured the navicular bone his right foot at training a week later. He was sent in for surgery and did not reappear. The West Australian forward spent more time in the midfield last year in a move that will stand in him good stead going into his third season in 2012. Played every game bar one, after his first season return of 13. Signed a two-year contact extension in August and is continuing to develop. Burst onto the scene against Melbourne on the Queen’s Birthday after some strong performances for the VFL team in the first half of the season. Had played a handful of NAB Cup matches earlier in the year, but took to the big stage magnificently with 15 disposals, a goal and one of the marks of the week against the Demons. Kicked a goal in all bar two matches, and established himself as the ideal substitute player due to his ability to make an immediate impact once on the ground. Gained widespread media attention when he kicked five goals from six kicks (and 18 disposals) against Essendon in round 19, with some flamboyant celebrations meaning he received plenty of screen time on the nightly news bulletins. Received an AFL Rising Star nomination for his efforts. Came onto the field late in the match against West Coast in the qualifying final and had perhaps the most valuable three disposal match in history – setting up Luke Ball’s match winning goal before kicking one himself after the siren. Was unlucky to make way for Dale Thomas in the preliminary final, but replaced Dayne Beams for the Grand Final. Spent the first three terms of a substitute and was unable to have an impact once on the field. Played for East Fremantle in the WAFL, and Western Australia in the U18 National Championships where he led WA for kicks, clearances and contested possessions. Managed six goals in a match late in the year to underline his potential. Slipped to Collingwood at pick No. 45 in the National Draft, with the Magpies hierarchy confident that they’d scored a bargain.